Payment fraud can be defined as an intentional deception or misrepresentation that is designed to result in an unauthorized benefit. Fraud schemes are becoming more complex and difficult to identify. It is estimated that industries lose nearly $1 trillion USD annually because of fraud. The ideal solution is where you avoid making fraudulent payments without slowing down legitimate payments. This solution requires that you adopt a comprehensive fraud business architecture that applies predictive analytics. This IBM® Redbooks® publication begins with the business process flows of several industries, such as banking, property/casualty insurance, and tax revenue, where payment fraud is a significant problem. This book then shows how to incorporate technological advancements that help you move from a post-payment to pre-payment fraud detection architecture. Subsequent chapters describe a solution that is specific to the banking industry that can be easily extrapolated to other industries. 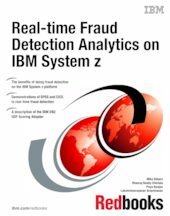 This book describes the benefits of doing fraud detection on IBM System z®. This book is intended for financial decisionmakers, consultants, and architects, in addition to IT administrators.